We have created this page in order that we may showcase some of the many successful adoptions that have taken place over the years. Of course, with over 30,000 animals adopted over a period of 35 years, the animals shown on this page represent only a tiny fraction of these adoptions. I wanted to send you all a quick update on Aztec. He is doing great with his ears as they no longer bother him, and his medication has been completed. I noticed that Aztec doesn't respond to calls when he is turned away from me, so I gave him the "banging on pots" test to see if he could hear them. Unfortunately, my other dog, Maggie ran in terror, but Aztec did not respond whatsoever. So I am assuming that he is deaf, which isn't uncommon for a dog his age. One other thing that I have noticed is that around sundown, he seems to get anxious and paces a lot. It only happens at night time. During the day, he is very energetic and playful. This week he started to stop and stare at corners of the room as if he were lost. So I did a ton of research. It appears that Aztec has what is called "Sundowner's Syndrome. I have started to leave on more lights for him at night and try to redirect him with toys and playtime when those moments happen. But I'm most excited about a natural medicine called Senilife. I will keep you updated. Hundreds of reviews rave about it's effectiveness, so I am praying that he responds well to it. Lastly, I wanted to share a picture of Aztec in my front window. I get to see his happy face evry evening when I arrive home. It always brings joy to my heart. I enjoy reading all your posts on Facebook and am so grateful for everything you have done in the past for my beautiful pup. 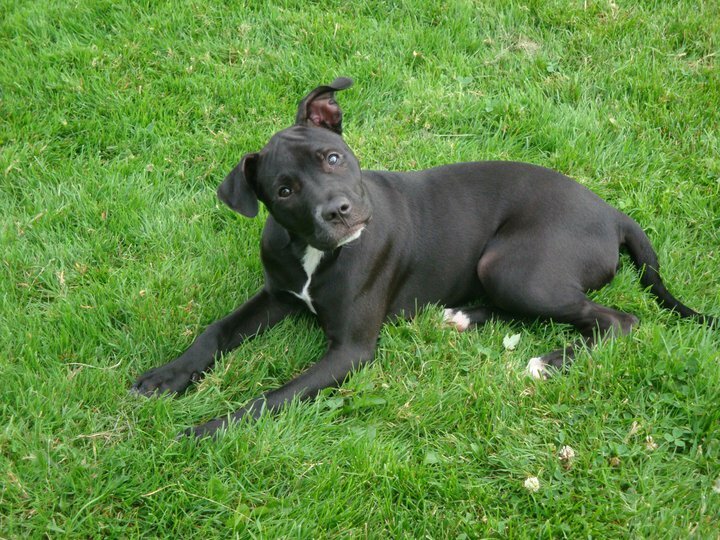 And we want to thank YOU Erick, for taking Aztec in and giving him the caring, loving home that he so richly deserved. It just goes to show how it's never too late for a dog (or cat) to go to the perfect forever home. Aztec snuggled down in his bed by the window. 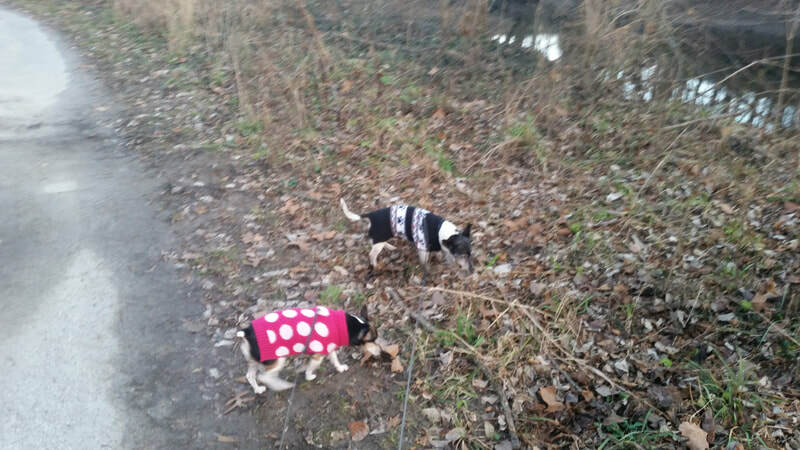 Aztec (top) and Maggie enjoying a walk in the park. 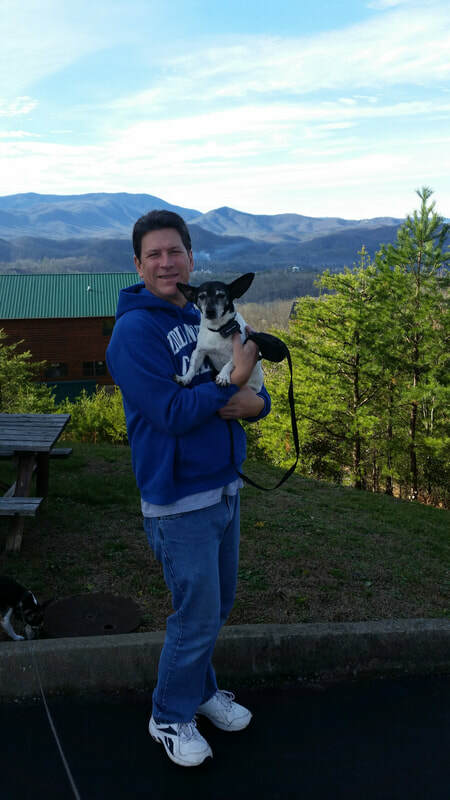 Aztec and Erick taking in the scenery on their recent visit to Tennessee. Chloe, upon having just arrived at the shelter. Chloe, with Suzanne at Petco. 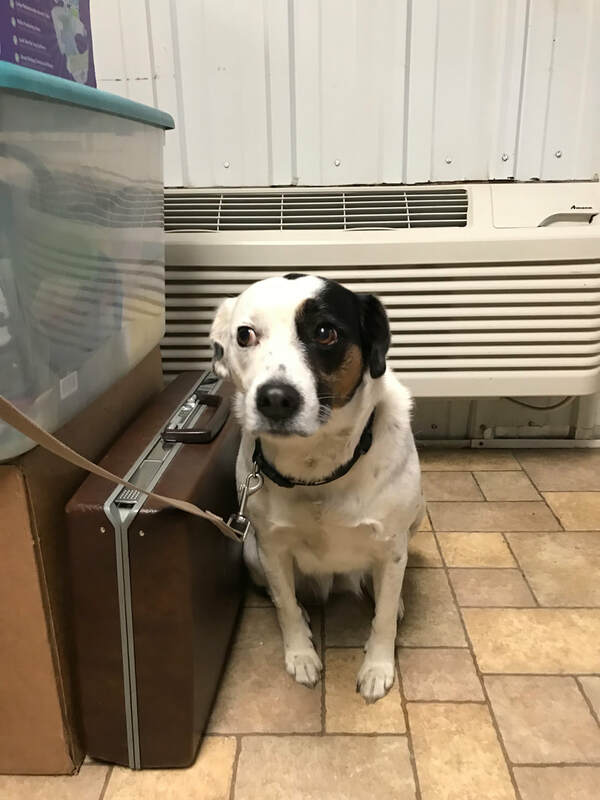 ​Chloe, a sweet 6 year old Beagle/Pointer mix, came to the shelter after losing the only home she had ever known, and was understandably apprehensive as to what the future might hold for her. After being checked out by the vet, and given a clean bill of health, she was ready to be adopted. 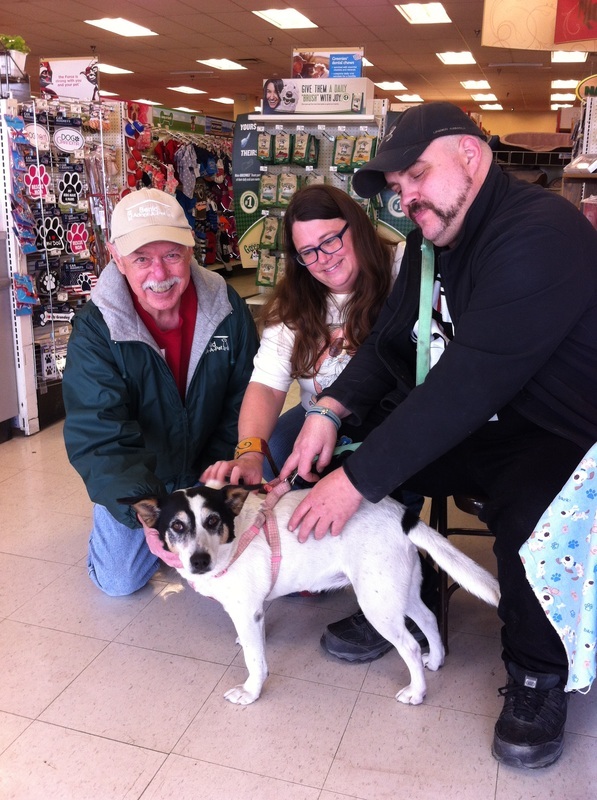 Shortly thereafter, on December 1st, she went on her first mobile adoption to Petco in Springfield. Shortly after having arrived, Suzanne Mejia came into the store, saw Chloe, and after a brief interval decided that she wanted to bring Chloe home with her. All seemed in order so the adoption was approved and Chloe went with Suzanne to her new home. On, December 16th, Benld Adopt-A-Pet was assisting with Santa Pictures at Petco, when what to our wandering eyes should appear but Suzanne and Chloe, coming up the aisle towards us. 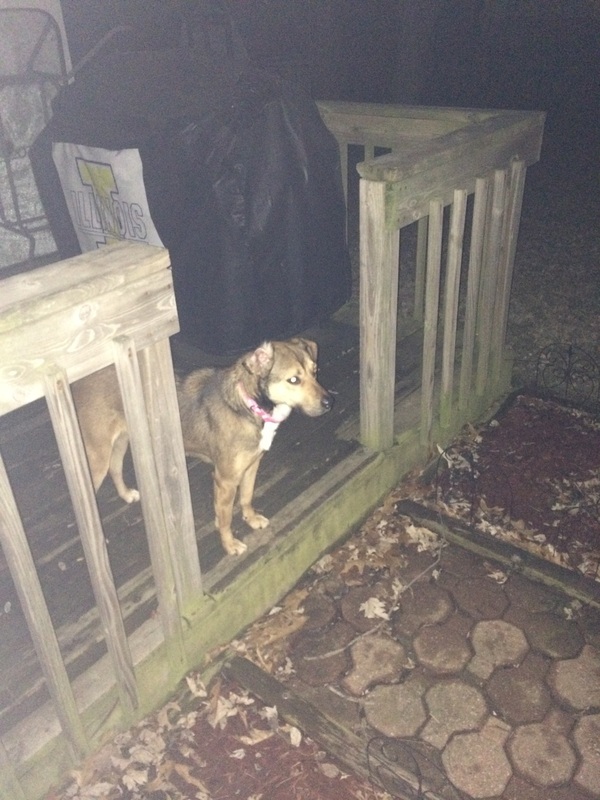 Following a brief conversation, and lots of hugs and kisses with Chloe, Suzanne informed us that after only a couple of weeks, Chloe had settled into her new home very nicely, just in time for the holidays. Merry Christmas and many happy New Years Suzzane and Chloe. Randall, a 5 year old black and tan Yorkie, who came to us from a breeder, was so scared we were concerned that he might never learn to adjust to living in a home. However, Lisa and Rod Jefferson who live in Springfield wanted him, so we decided to give it a try. Lisa and Randall came to visit with us at a recent adoption in Springfield and, as you can see by the photo Randall, snuggled into Lisa's arms next to Shelter Director Lorraine Jackson, is now very much settled into his new home with these nice people, and according to Lisa, is doing very well. We received the following e-mail this morning. Hello, this is Adora. 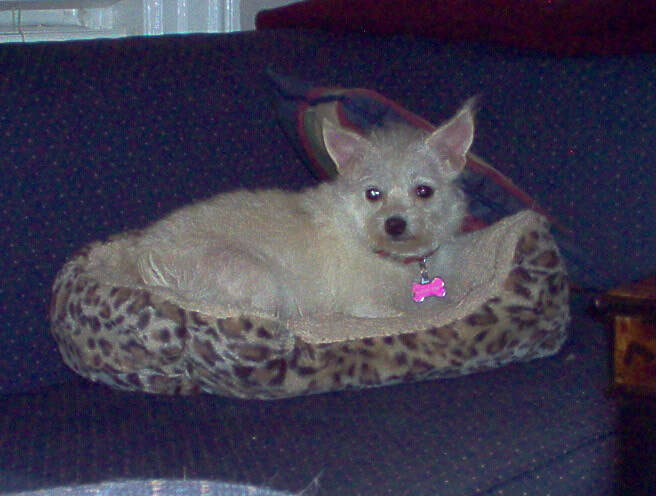 I'm the one who adopted Bailey (the Italian greyhound/wire haired terrier from California). My husband Darrin wanted to change his name to Buddy, so he is now known as Buddy. Buddy has been the best pup we could have gotten. 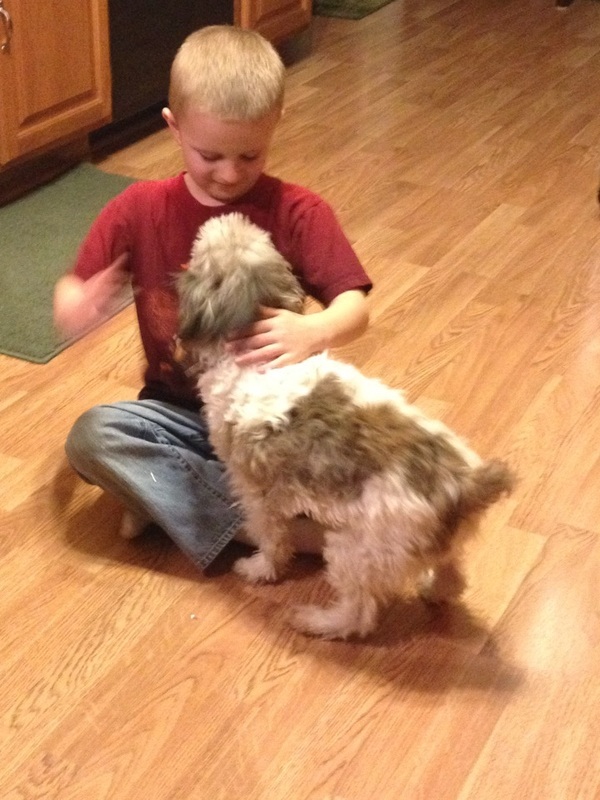 He fit right into our home and our girls, Mopsy (black & White poodle mix) and Scarlett (dachshund) get along with him. Buddy has gotten our girls to be more active (they really needed that) and has gotten them to play with him. Than you for letting us adopt him. Buddy is beyond spoiled and has brought us so much joy. Luna is enjoying her new home immensely! We just received this message from Sue Anderson, who adopted one of our "project dogs" recently. "Luna loves to play! We really enjoy her sweet personality. Thank you." 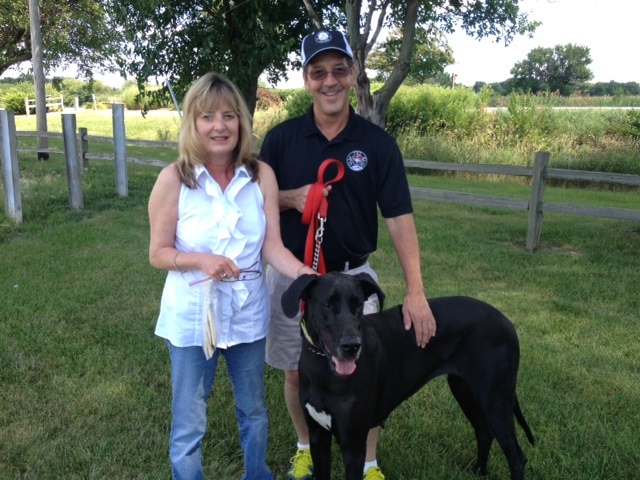 And "thank you" Sue, for providing Luna with the happy home she so richly deserves. We look forward to receiving future updates on how she is doing. She even loves the cats! 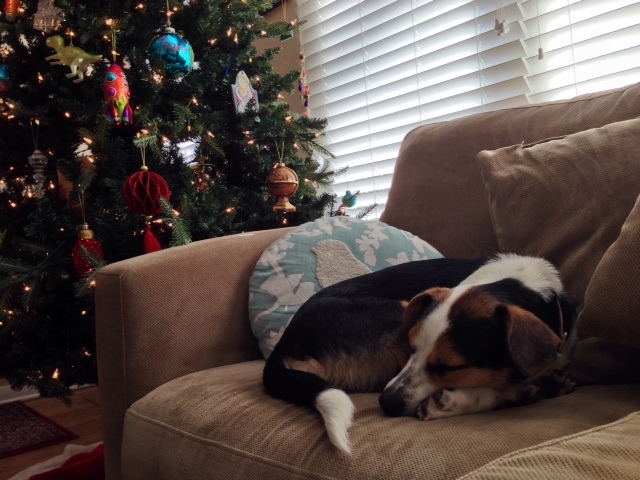 "Just wanted to give you an update on Ronnie, who we adopted at PetSmart. 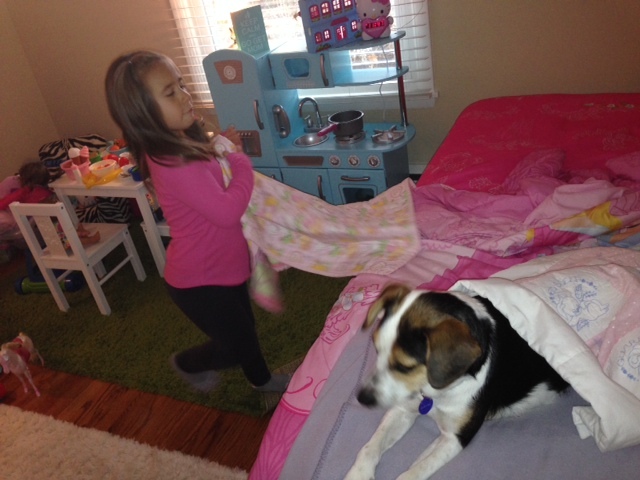 She is doing great with our dog and cats." 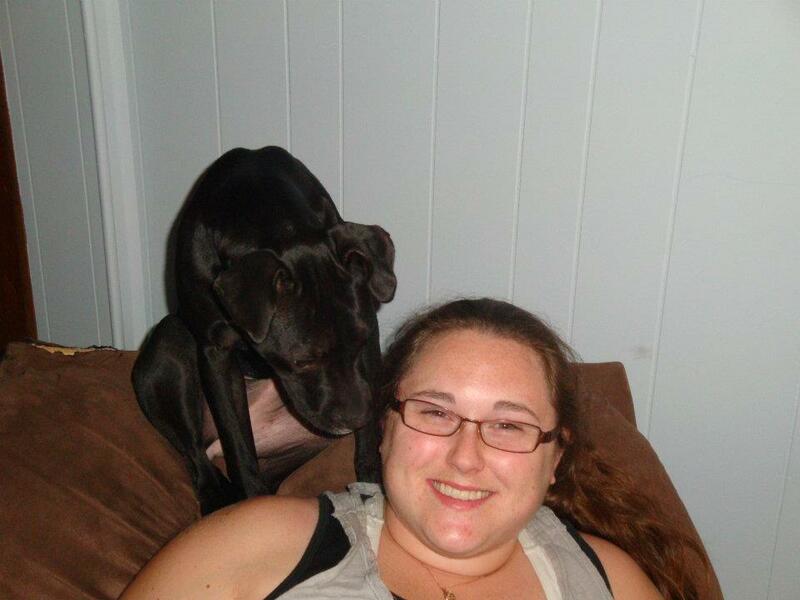 "Thank you so much for our sweet girl "Remi" previously known as "Lexus". She is very spoiled and loved! We recently received the following letter from the nice folks who adopted Angus, a Beagle/Hound mix a short while ago. Our little Angus is a good dog. Loving him has been first on our list and he's responding well. Thanks for the treats, we've never seen these soft treats. We did find them at Target. 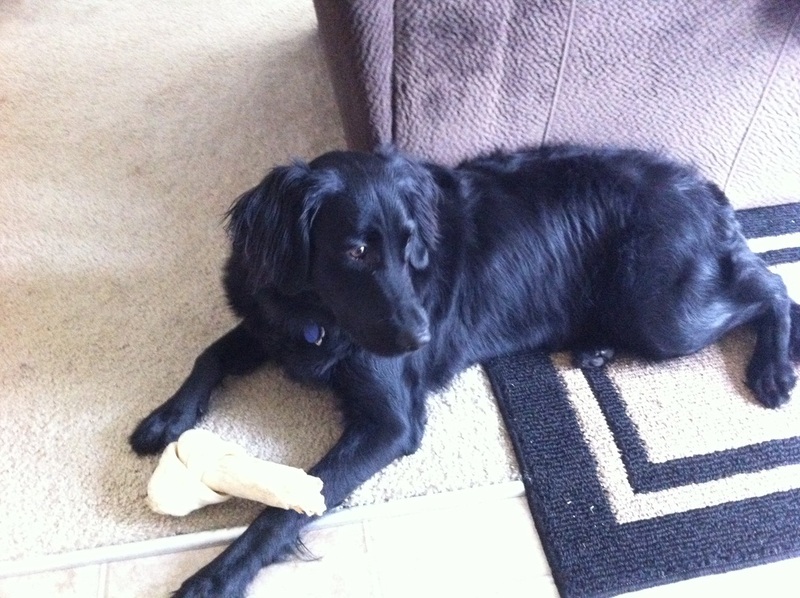 He eats well and likes to walk, but tires easily, we did find out he had a heart murmur. Since he's only 7 he may have been born with it. Bill, I know you miss him, but we want you to know he has healed our heart. He's learning to love us back. In one week he's learned not to run out the front door, he's learned we go out the back door. He's a very smart dog. He sleeps with us and cuddles in the middle of the bed. He has his own recliner. Last but not least, he has not jumped the fence or tried to get out. He likes people and gets along well with other dogs. He's barking now, which tells me it's his home and he's going to protect it. God bless you all for what you do. Thank you! This is Jessie, I hope you remember me, I spent a lot of time there. It's been a little over a year since I rescued my family, and I wanted to let you know I am happy and healthy, well, except for the aches of older joints, but my mom gives me some tasty chews for that! I have a large yard to explore and my mom takes me to the park for walks too. I just wanted to let you know, I'm staying here. I found my forever home and I want to thank you for everything you did for me while I was there. 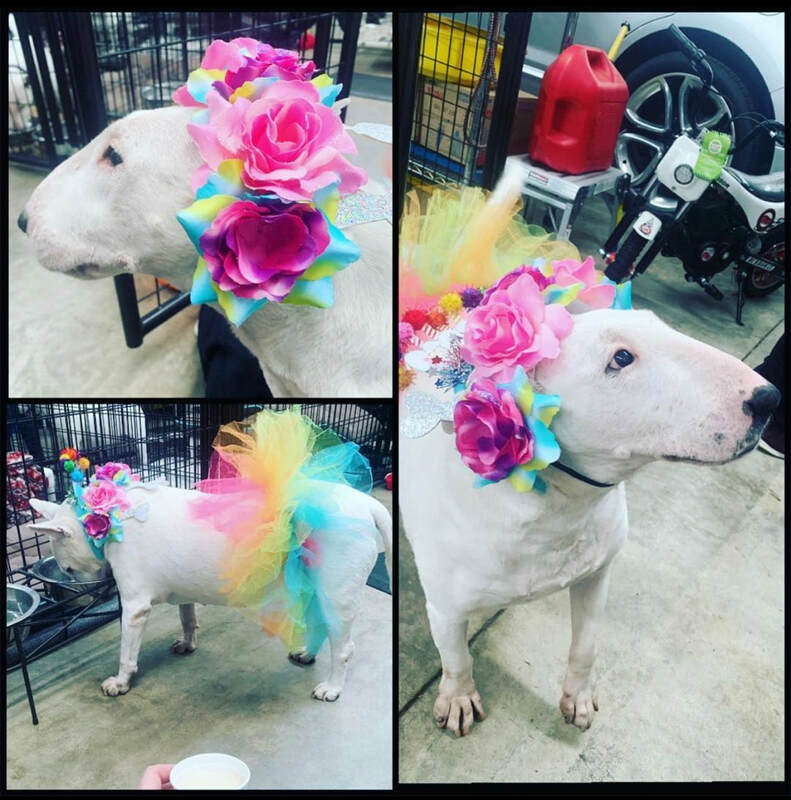 Back in June of 2015 we took in a very friendly English Bull Terrier by the name of Pompeii, who shortly thereafter was adopted by a nice couple from Williamsville IL, who had seen and fallen in love with him. 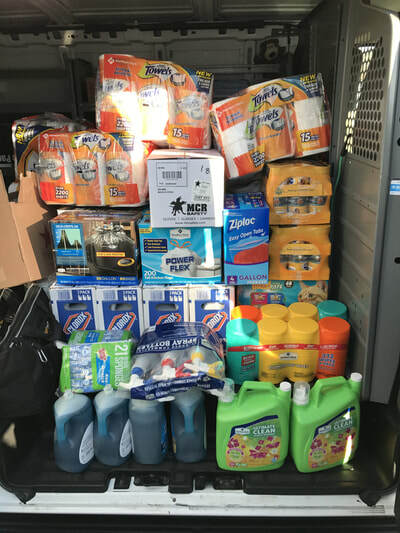 On Monday, December 11, 2017, Pompeii and his "adopted" parents came back for a visit and brought along a whole van full of supplies for the shelter; dog and cat food, bleach, detergent, gloves, paper towels, bedding, wire cages and more, as well as a tray of yummy cookies for the staff to munch on. Thank you mom and dad and Pompeii! Do come back and see us again soon. 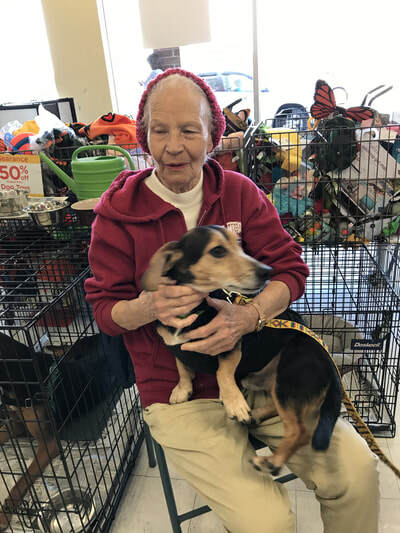 When volunteer Lindi Gibson came to lend a paw at our adoption at Petco on November 19th, she brought along a friend, Stewie, a cute little Beagle/Dachshund mix whom she adopted from us this past summer. As you can see from the photos above, Stewie lost no time getting reacquainted with Bill (left) and Lorraine (right). 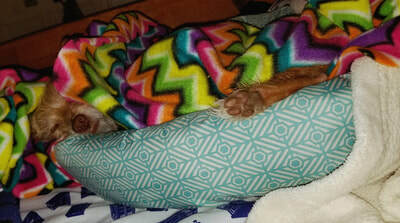 We recently received this photo and note (below) from the person who adopted Stewie, a cute little Dachshund/Beagle mix awhile back. "Wow! 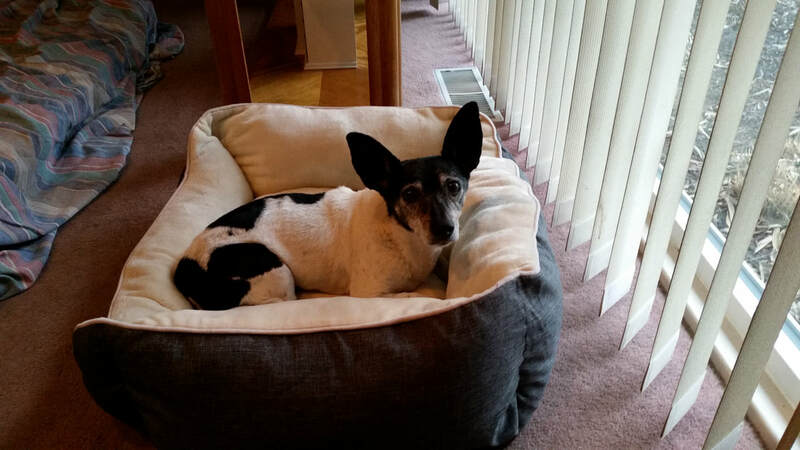 How life has improved for Stewie since experiencing homelessness, hunger and distress, to finding an adoring home, thanks to Benld Adopt-A-Pet. Stewie now lives on a mini-farm with 4 other new friends. Every time the farm vehicles leave the barn you can see Stewie riding along. Stewie is willing to share his seat with the owners 2 year old grandson. 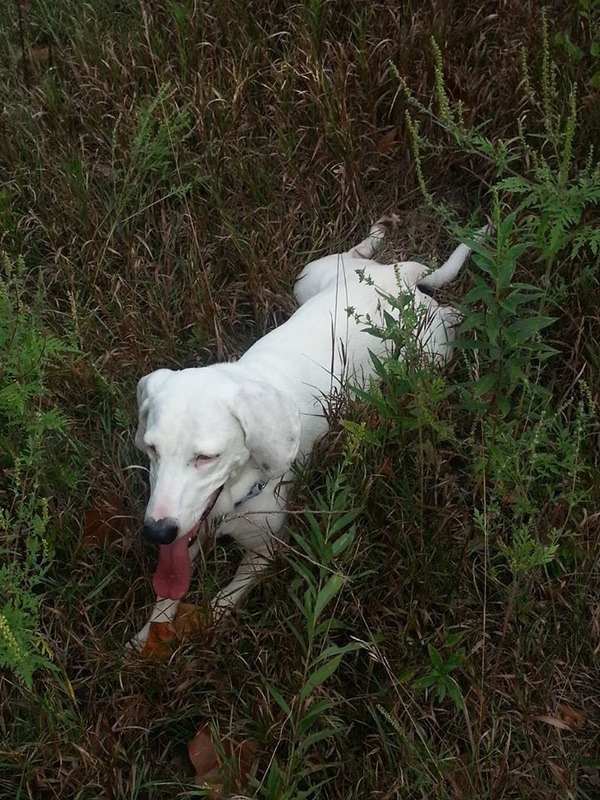 What a wonderful dog and a perfect life he is now experiencing possible only because of Benld Adopt-A-Pet. Thank you for all you do." Lorraine (left), with Spud (formerly Tibet) and "mom"
Back in the month of May, during one of our appearances on "Good Day Marketplace" at WRSP-TV in Springfield, a little Lhasa Apso by the name of Tibet appeared with Lorraine on the program. A few days later, during one of our mobile adoptions at PetSmart in Springfield, a young couple saw and fell in love with Tibet, and wound up adopting him. 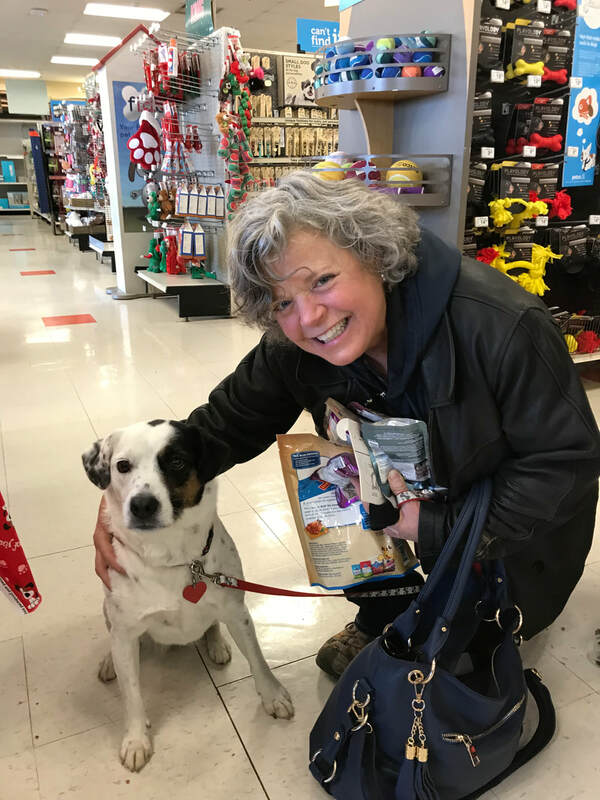 During a subsequent adoption at PetSmart in Springfield this past Sunday, June 25th, who should suddenly appear but Tibet, now named Spud, who, with his new "mom", came over to say "woof" to his former benefactors. Spud seemed to remember Lorraine fondly and could hardly contain himself during the visit. 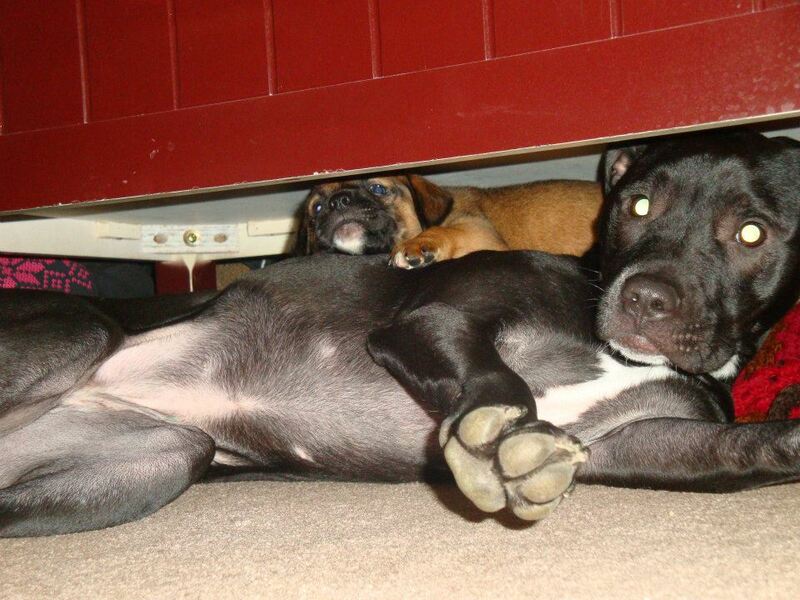 It would appear that Spud has found his forever home with his loving new family. 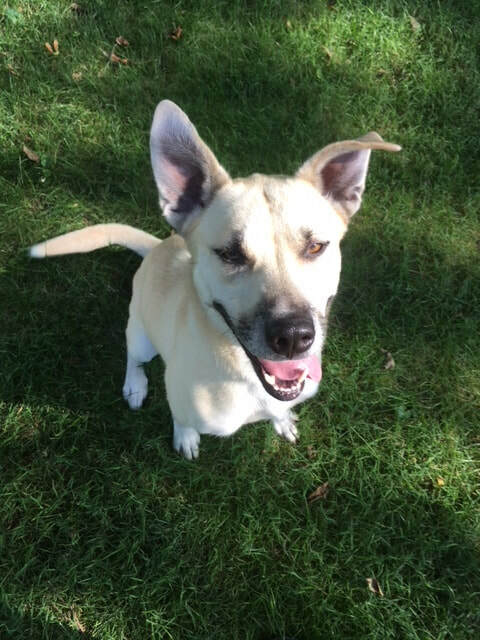 We were beginning to wonder whether or not we would ever be able to find a good home for Jessie, a frisky and lovable Labrador/Pit Bull mix, who had been at the shelter for far too long. During his long tenure at the shelter, Jessie had become especially close to Bill, one of our volunteers, who often visited with, and took him for walks, both at the shelter and at some of our mobile adoptions. Then, about a month ago, at one of our mobile adoptions at Petco in Springfield, this nice couple from Springfield came along, took one look at Jessie, and said "We want that dog!" Jessie had found his new forever home. Naturally, Bill was happy for Jessie, as it is our stated purpose to place our "residents" into good, loving forever homes. 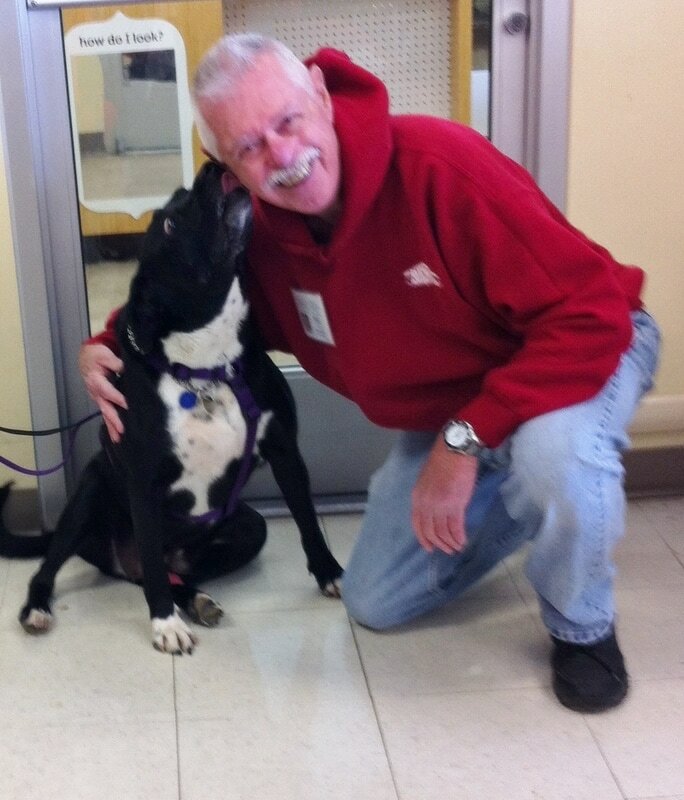 At the same time, Bill missed his buddy Jessie, and thought that he might never see him again. 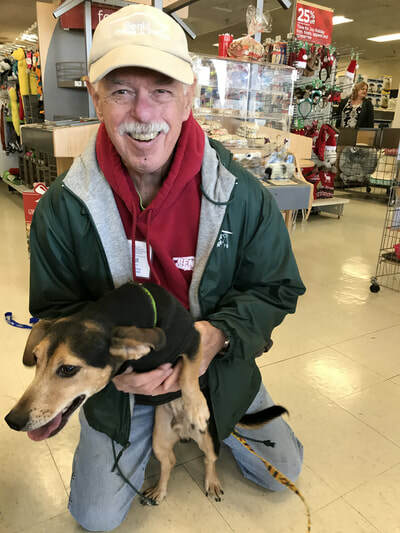 Lo and behold; on Saturday, April 1st, during the course of another mobile adoption at Petco in Springfield, Bill was engaged in doing something when he felt a nudge on his leg. He looked down, and to his delight, there was Jessie come to say hello to his buddy. Needless to say; it made Bill's day, and it appeared that Jessie was pretty pleased as well. Abby came to us on 03.27.01 after having been abandoned in a cabin. Though she is very gentle, she is also very timid, and so while her siblings were soon adopted, Abby remained at the shelter. 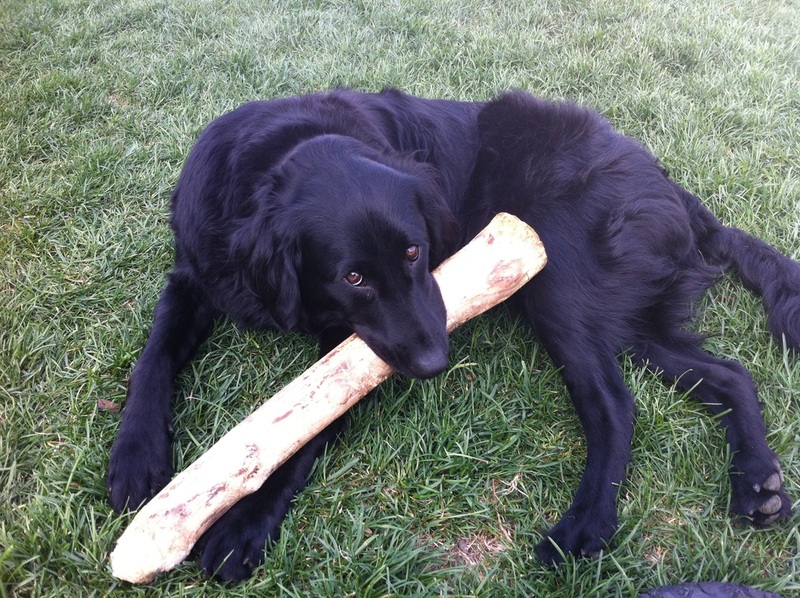 The years passed and, as she grew older, it appeared that Abby might be destined to live out her life at the shelter. 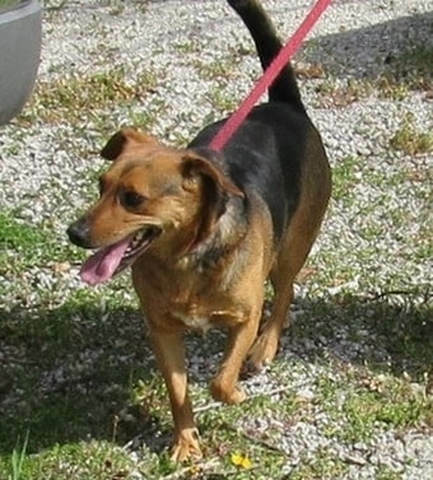 Then along came a nice lady by the name of Ariel who was looking for an older dog to join her four footed family. 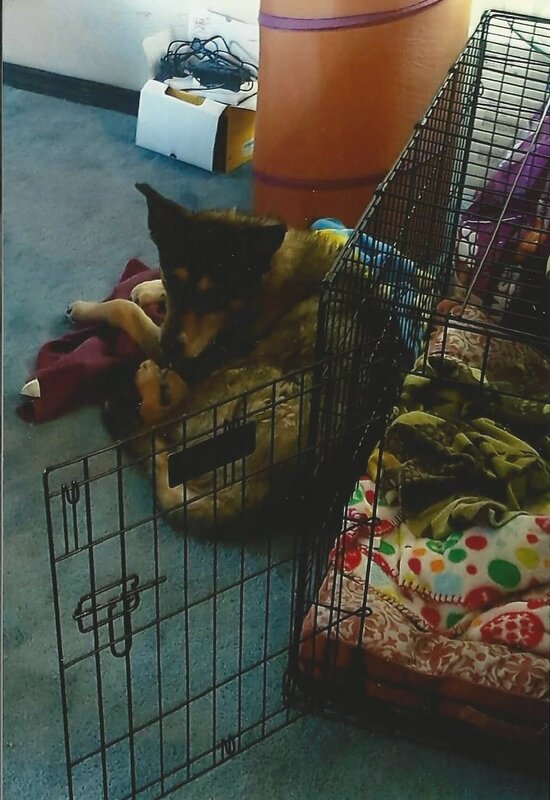 We recently received a nice letter and some photos from Ariel advising us that Abby has adjusted to her new home very nicely, and is getting along with both her canine and feline companions very well. In fact, she sometimes gets bursts of energy that are surprising for a lady her age, much to the amusement of the entire family. If there is a morel to this story it might well be that it is never too late for any pet to find a good home and true happiness. 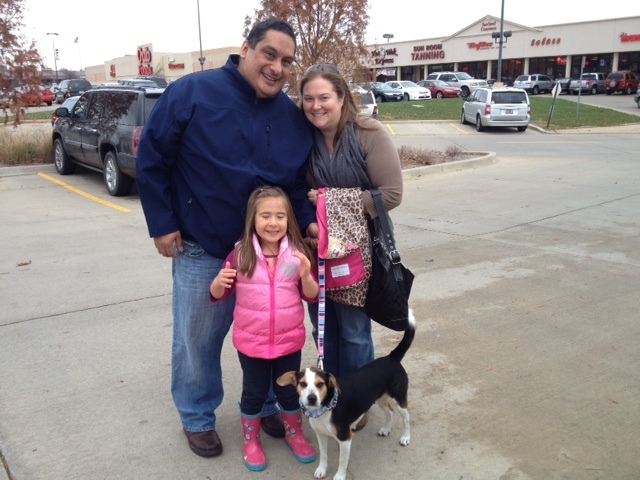 We wish Abby and her new family many happy days together. Enjoy! 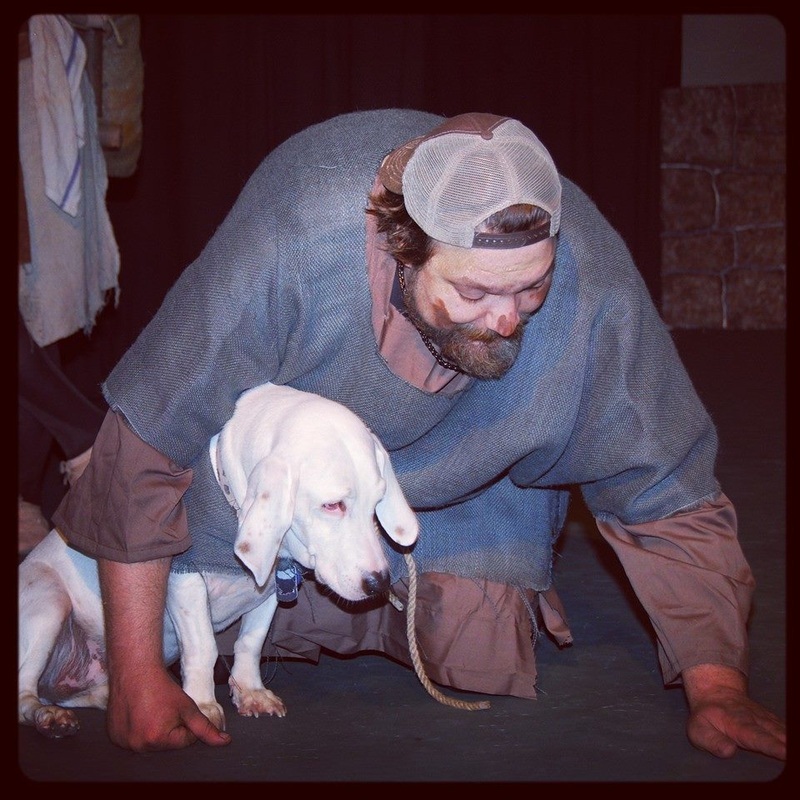 We would like to quote some excerpts from an e-mail we recently received from Matt in Springfield IL, regarding a dog he had adopted from us back in 2002. 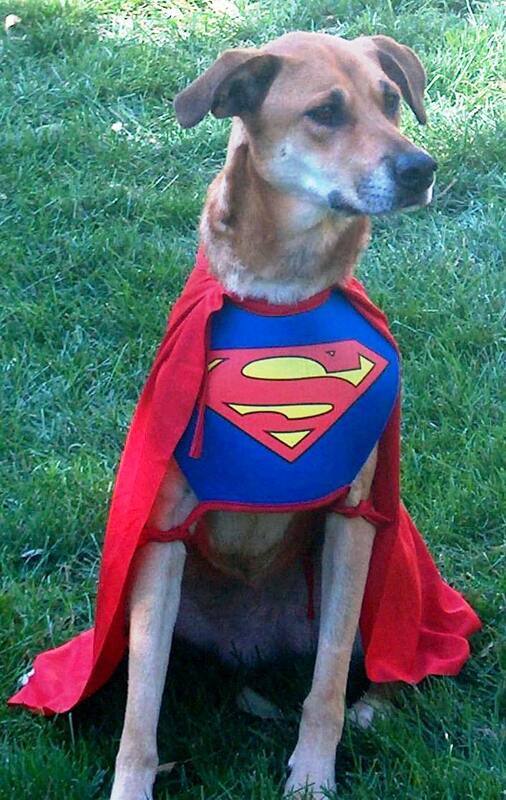 "I had adopted an absolutely fantastic dog from your facility in September 2002 at Petco here in Springfield. She just crossed over the rainbow bridge on Monday (3/13/17) after a brief illness at the age of 15." "I cannot say enough positive things about your facility and the animals you care for!" Matt then went on to say that he will likely be contacting us about finding him another four footed friend shortly. 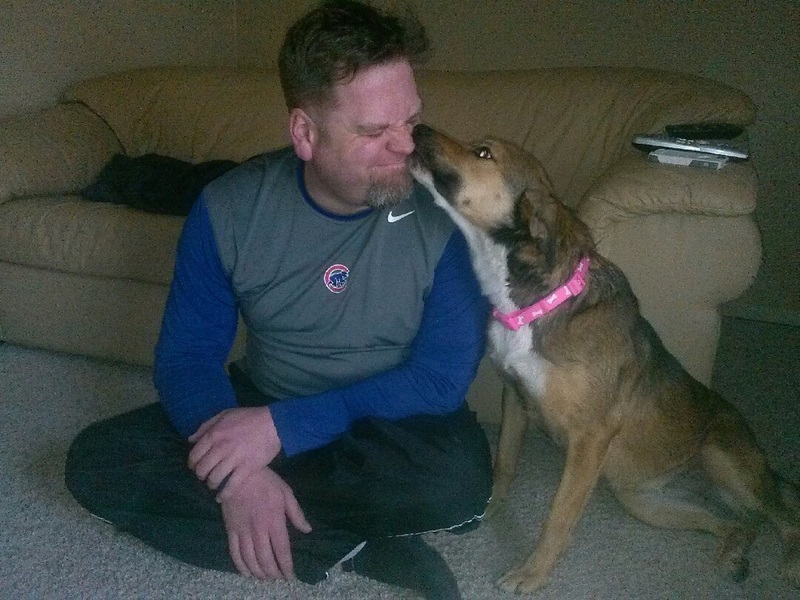 Thanks for the kind words Matt, and thank you for giving Goldie such a good forever home! From the day we first saw Lucy, a Terrier mix, at one of our Mobile Adoptions at Litchfield almost two years ago, we couldn't understand why she didn't get adopted. Time and time again we thought that "this" would be the day but -- alas; things just didn't quite work out. But we were determined to find this sweet girl a good home so we kept on trying. 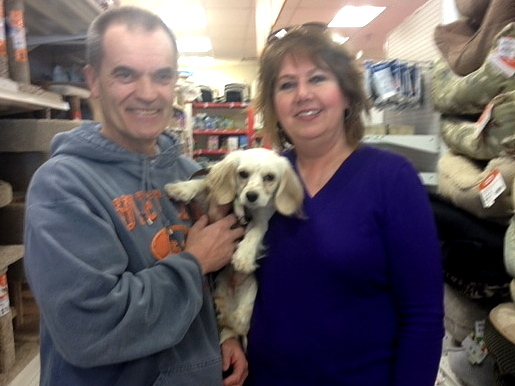 Finally; at our Mobile Adoption at Petco in Springfield on March 20, 2016, a nice couple came by, looked at Lucy, and said "We want her!". 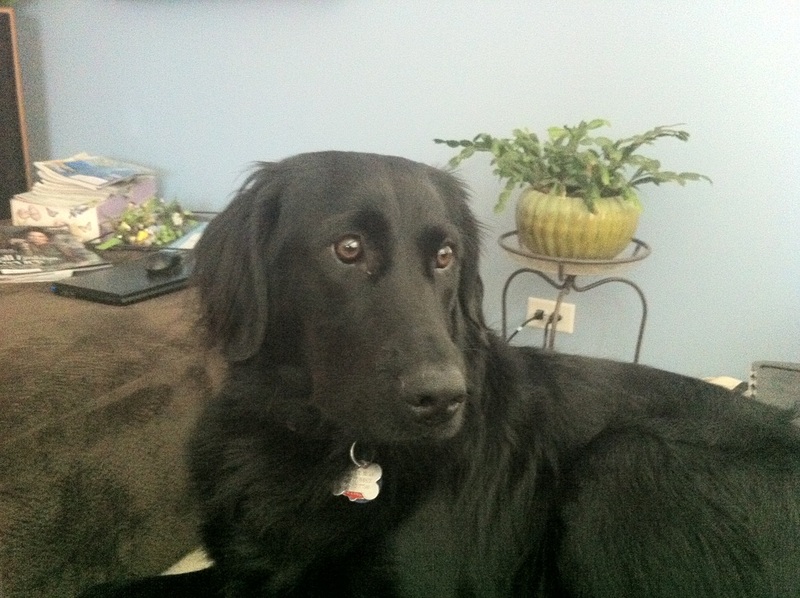 Lucy is now living in her new forever home and receiving the love and attention that she always craved. Hooray for Lucy! We recently received these photos and the following e-mail from the nice folks who adopted Shadow last year. "I thought you guys would find it amusing to know that your alumni had a secret talent she has been keeping from us all along. She's an actress. 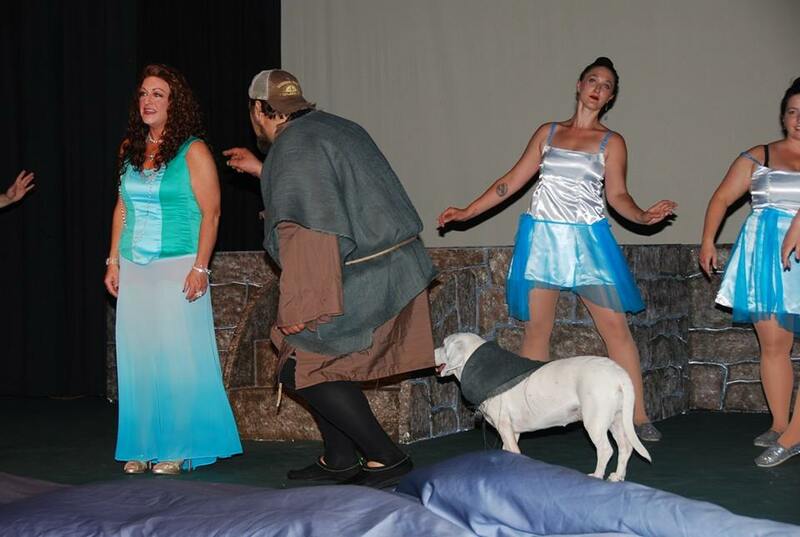 We were involved in the recent show "Spamalot" at the Looking Glass Playhouse in Lebanon IL; the director was so impressed with her good behaviour, they gave her a part in the show, which she performed in 4 nights a week for 2 weeks. She was astounding!! Everyone has been raving about her and she's so popular she even has a facebook fan page www.facebook.com/ShadowTheDalmatianBassetHound?ref=hl , where her fans can catch up with their favorite canine star. Shadow was so great in the show, she has even been invited back to be in any shows she wants to take part in. How funny is that? She's a little Diva! We're so very proud of her!" 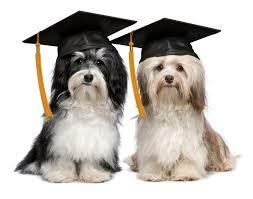 Ed's Note: We're extremely proud of Shadow also! In fact, we're fairly bursting with pride! For more on Shadow, click button below. 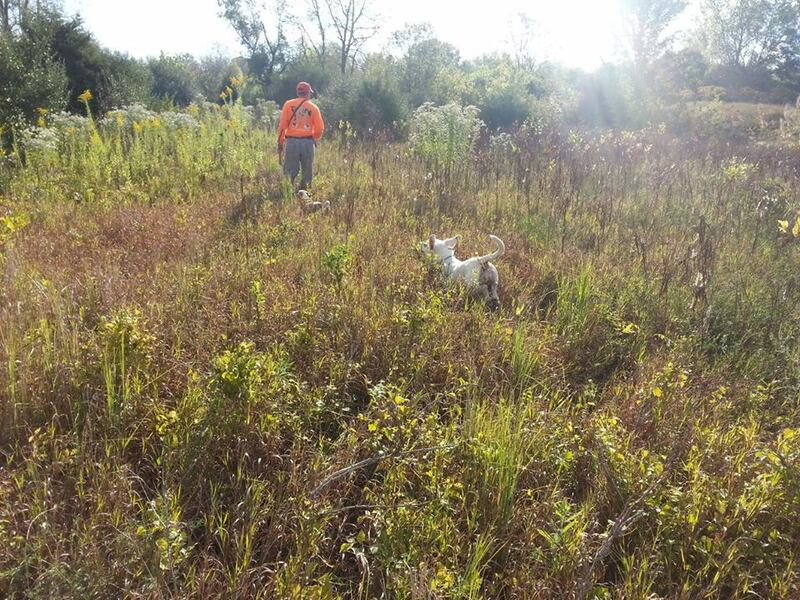 Last summer, one of our volunteers picked up two lab mix puppies from an unplanned litter near Virden IL. 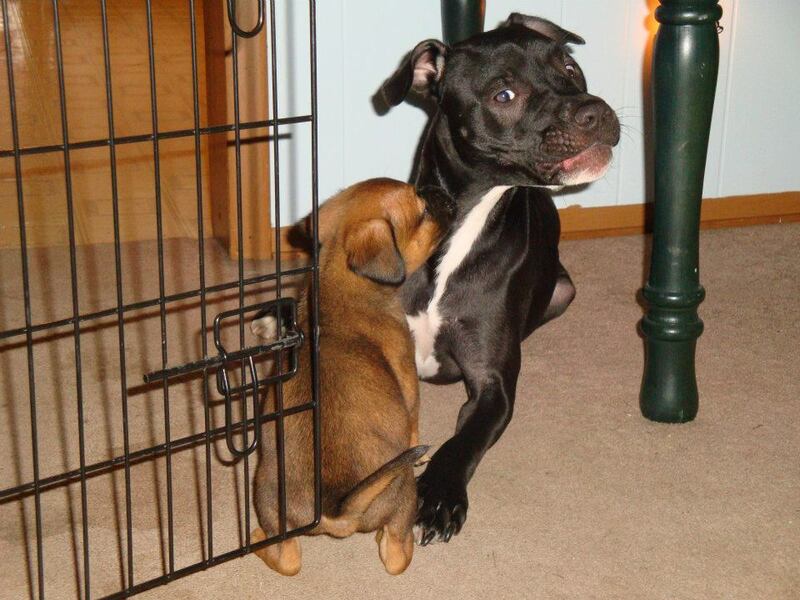 One of the puppies, now called Jonathan, was adopted by a nice family in central Illinois. It would appear, judging from the video below, that Jonathan is a pretty contented young fellow these days. The two Shelties with Jonathan came from Benld Adopt-A-Pet as well. Blair has finally found the perfect home! 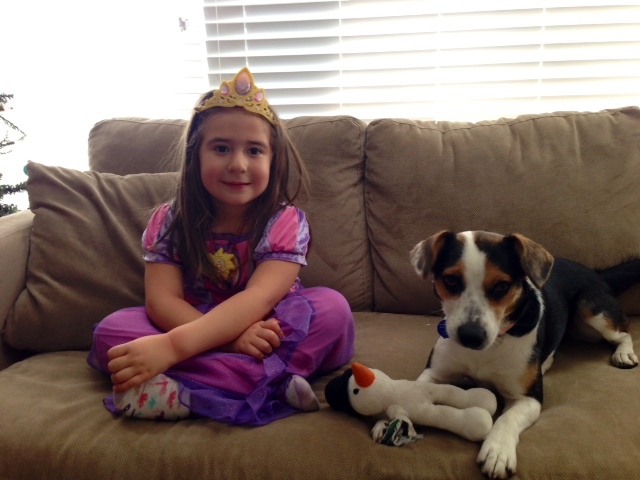 Just when it seemed as though she might never be adopted, Blair has found a home. Blair was extra special to some of us at Benld Adopt-A-Pet, and we are thrilled that she has finally found true happiness with the perfect companion. In fact, judging from these pictures, it appears as though Blair is in doggy heaven... figuratively speaking, that is. Congratulations to Blair and her new companion, and we hope that they will drop us a line from time to time. Awhile back, we got in two darling little Cockapoos which we named Lilly and Olive. Adorable pups that they were, it didn't take long for both to get adopted into good homes. Then, at one of our recent adoptions, we noticed a lady with a Cockapoo that we thought looked familiar. Sure enough, it was Lilly, though her name has been changed to Bailey. 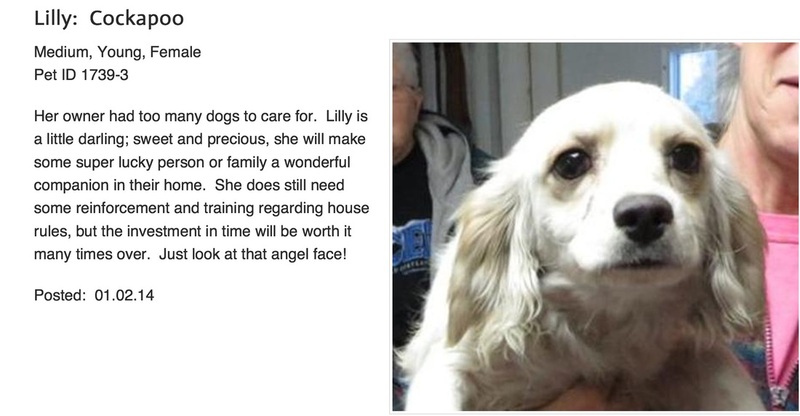 Above, Lilly as she appeared on our webpage prior to her being adopted. 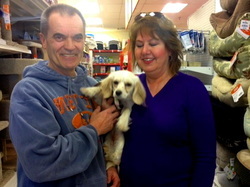 Below, Lily (soon to be Bailey) with her new parents. 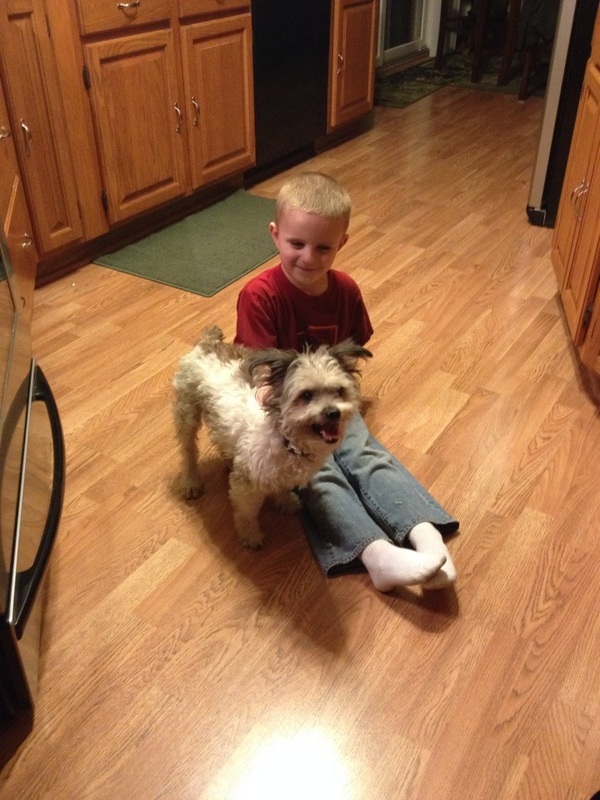 Toby has a new home and a new friend to play with! We were somewhat concerned when Toby arrived at the shelter, as he was a senior dog and had lived in the same home for his entire life. So we knew that we had to find a very special home for this sweet boy. Then, a nice lady saw his picture on our website and immediately determined that Toby was exactly what they were looking for. 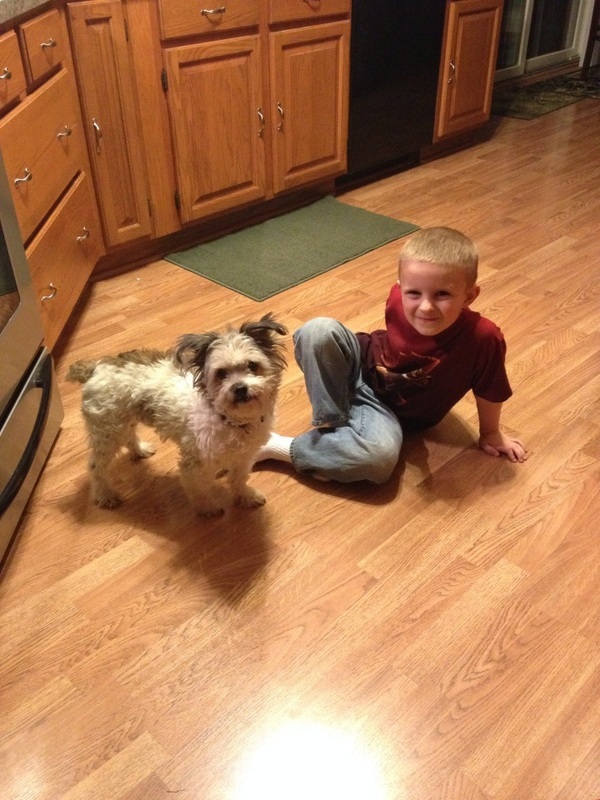 Now, Toby not only has a loving new home, but a great new playmate as well. Hooray! It appears (clockwise from lower left) that Toby and his new friend Cody are having a great time getting to know each other in their newly shared quarters. 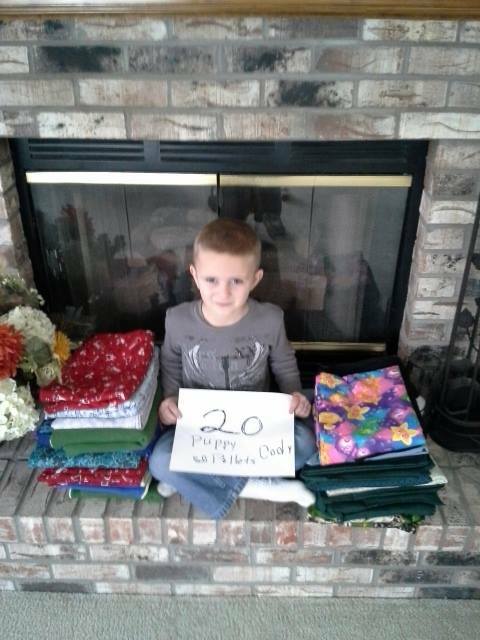 At lower right, Cody sits among a pile of doggie blankets that he and his grandmother made and donated to Adopt-A-Pet. 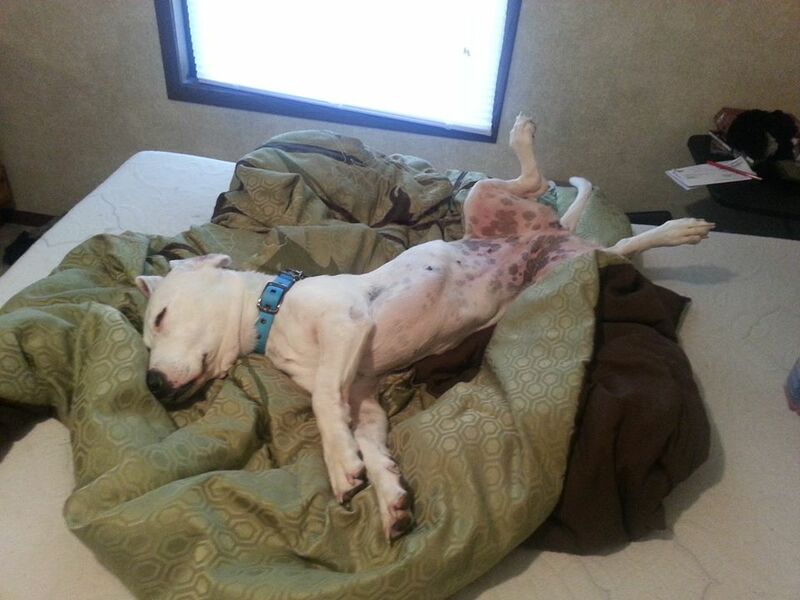 A lot of dogs are sleeping warmer and snugger as a result of this generous donation. 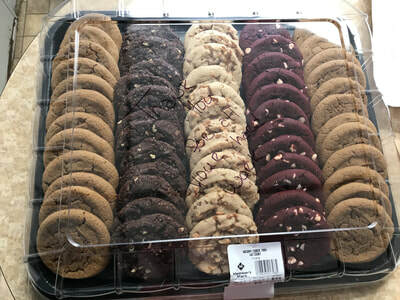 Thank you Cody and grandmother! 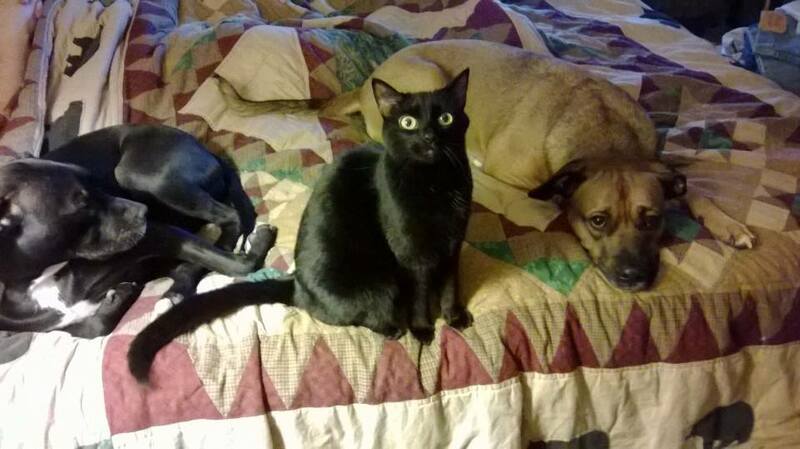 We received these photos of Sweet Pea...now Bel Air, along with his "little" buddy Bear and Samantha the cat, and just knew that they had to go on our Alumni page. Sweet Pea was adopted by a nice family nearly three years ago and, as you can see, she has made herself very much at home. Thanks Steve and Alison for sharing these great photos with us... and others. Back on July 4th of this year (ironically Independence Day), we picked up a sweet, laid back Basset Hound named Shadow from her family who were moving and couldn't take her with them. Shadow was understandably confused and sad to be leaving the only real home she had ever known, but we promised her we would do our best to find her another nice family to live with. Exactly one month later, on August 4th, a nice lady came along and said that she would like to bring Shadow home with her... and she did. As the pictures below show, Shadow has found her happy new home and family who are giving her all the care and loving she could desire. Shadow is one happy dog! Addie and her family out doing some shopping... perhaps for the holidays. Is that a new collar and leash that Addie has on? Upper left: Gemma and Addie hanging out on the sofa. Upper right: Addie doing some undercover work. 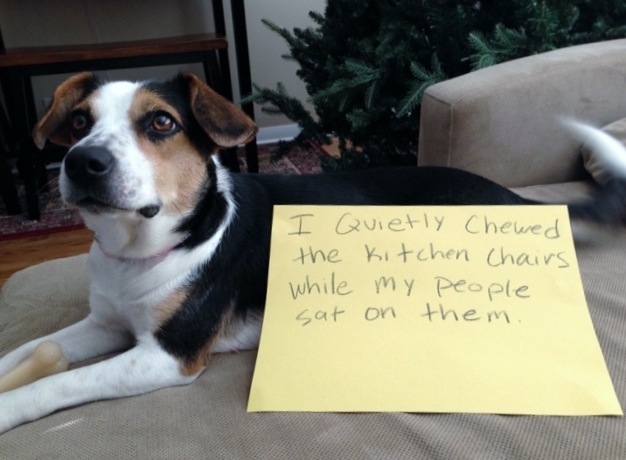 Lower left: Addie is a very smart dog, as the note shows. Lower right: Addie taking time out from her busy schedule. 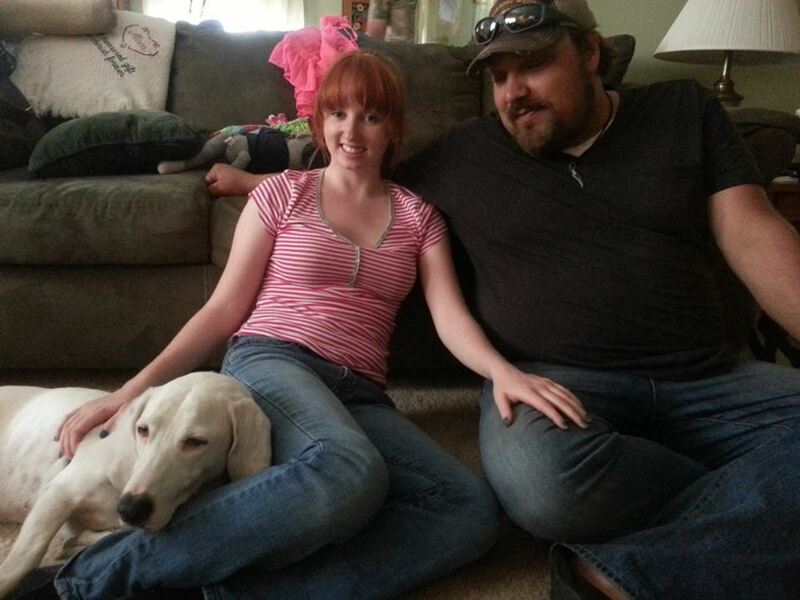 See video below of Addie with her new family. 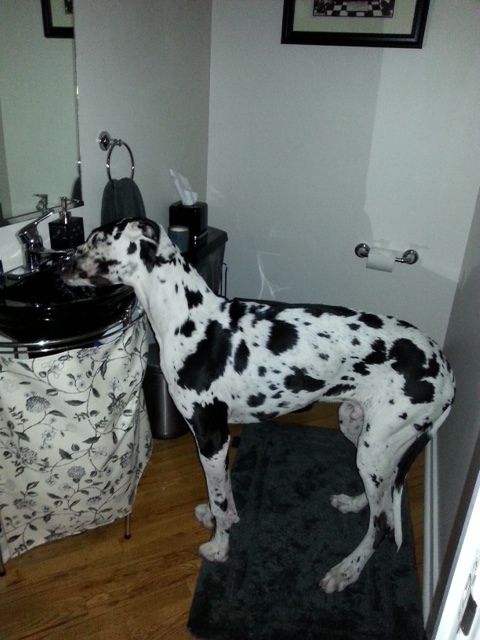 Above: Who needs a water bowl when you're a Great Dane. Disco getting a drink direct from the tap. Below: Disco lounging about on his bed... formerly the sofa. 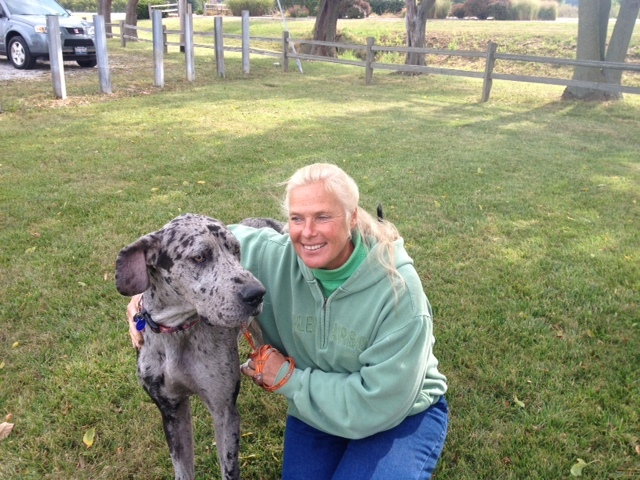 Joe-Joe isn't looking for a home no "mo"
In the above photo Joe-Joe, a Great Dane who came to BAAP looking for a new home awhile back, gets acquainted with his new "mother" on a warm sunny day. 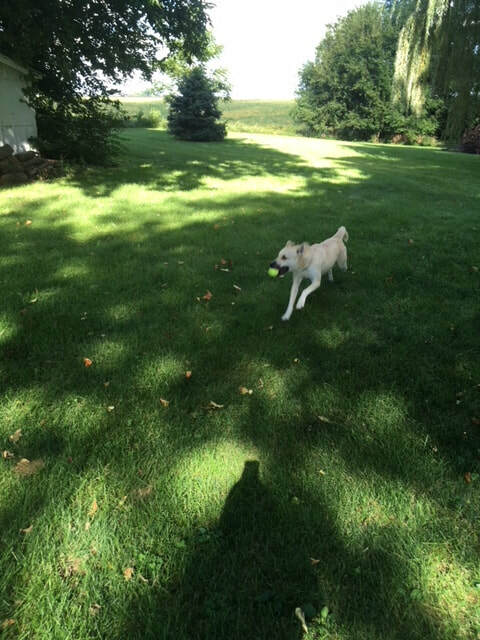 We recently received an e-mail and pictures from Brian and Lynette Kucharski regarding the Lab/Retriever puppy they had adopted from us in June of 2012. Here is what they had to say about Maxx. 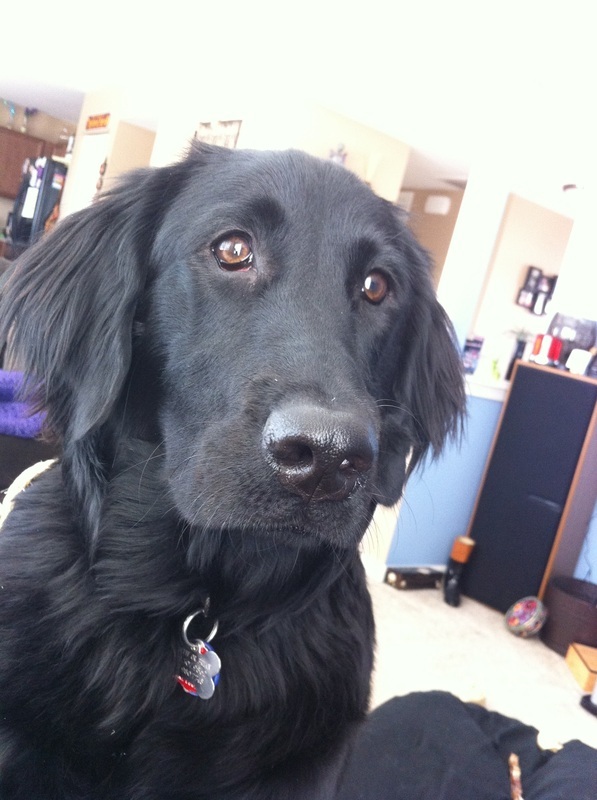 "He is such an awesome dog, a great friend and companion, and he goes everywhere with us. We're taking him with us to a BBQ today. He brings several toys to you at once... as many as he can get in his mouth! He loves to be outside, loves his walks, and really loves chewing on his log. Yep; no stick for him, he took that log right out of our wood rack. 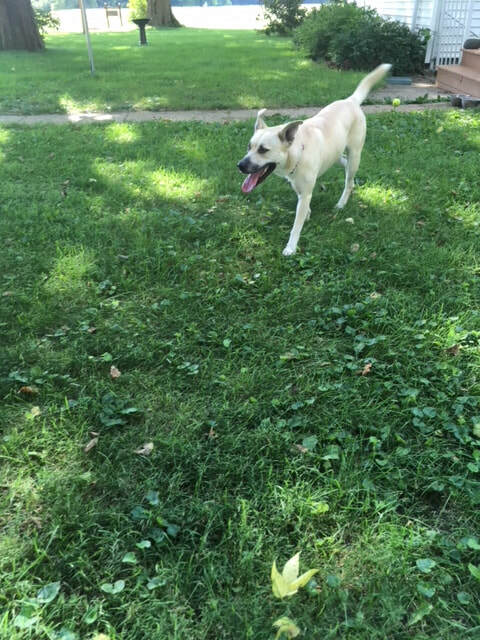 He likes to swim, play fetch, and just has to be with you all the time. He gets so excited when we get home, he almost cries or whines, and his tail is going 140 mph, and banging into everything. He is Lynette's five o'clock shadow, and is 100% a mama's boy/dog. 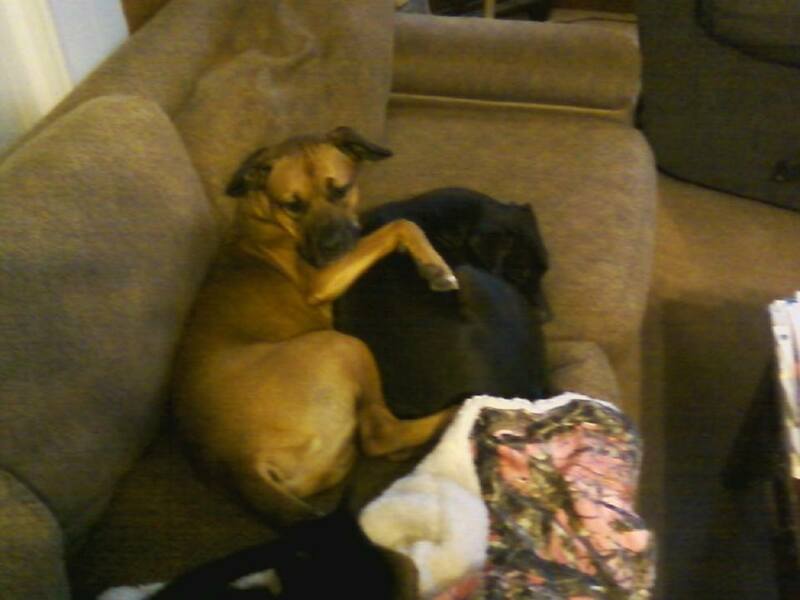 He cuddles with her on the couch and follows her everywhere. We are very blessed to have such a well behaved, good demeanored dog. Thank you!" Some time ago, we took in a pregnant Great Dane named "Olive Oil" whom the shelter staff promptly renamed "Ollie" for short. We don't get a lot of Great Dane's at our little shelter, so finding her living quarters presented a bit of a challenge until we placed her in a reception room. 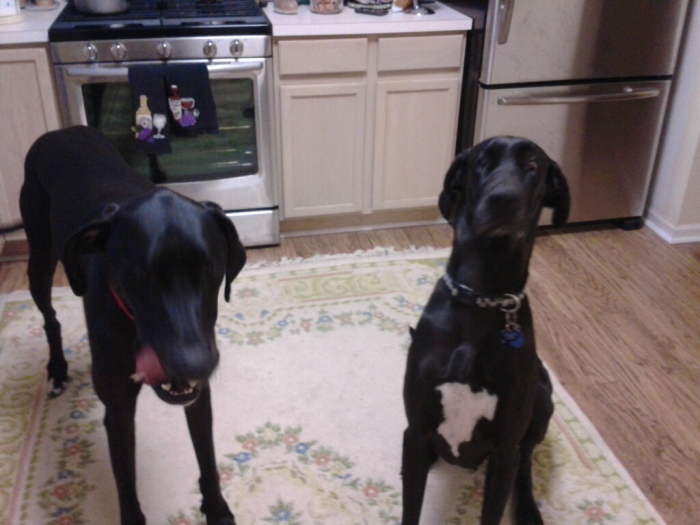 Then, after her pups were all adopted, we located a nice family who already had a Great Dane named "Elwood" and so were familiar with the breed. 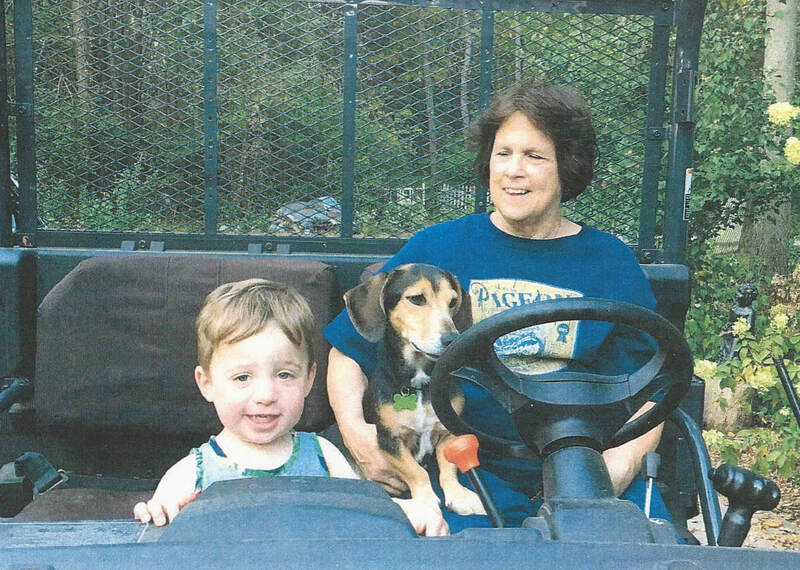 On August 3rd of this year, Shelter Director Lorraine Jackson accompanied long time BAAP volunteer Joy Laughlin, in driving Ollie to her new home near Bloomington IL, where she met her new family. Shortly, Ollie had had a bath, was playing in the back yard with her new roomie, and was sitting in the kitchen watching mom prepare supper. Ollie is home! Now that's a lap (full of) dog! 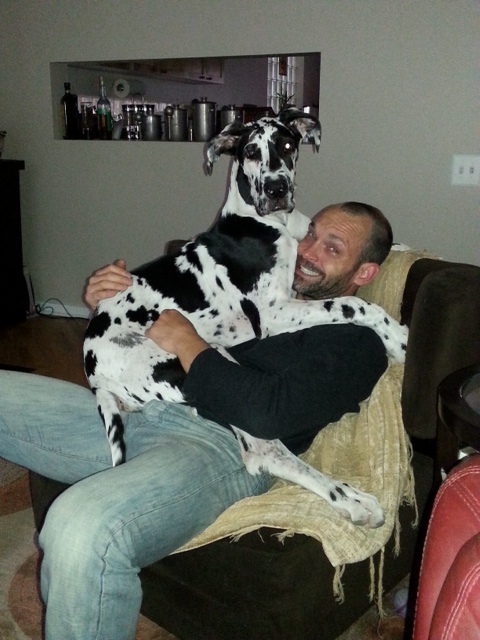 Disco the Great Dane doesn't seem to realize what a lapful he is for his daddy. 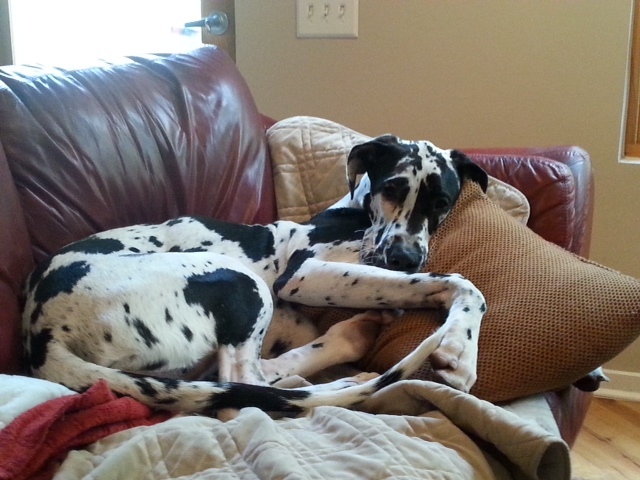 After all, at 6 months old, he is still a puppy, even if he weighs in at over 80 pounds. By the way, Disco is one of Ollie's "puppies" and was adopted recently by James and Jennifer Bach who reside north of Springfield. Another "tail" with a happy ending! 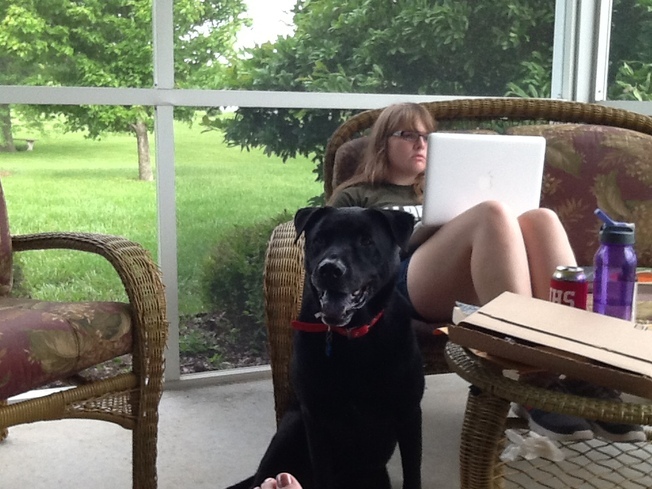 We recently received the following from the family that adopted Kenny, a Lab/Chow mix from us awhile back. 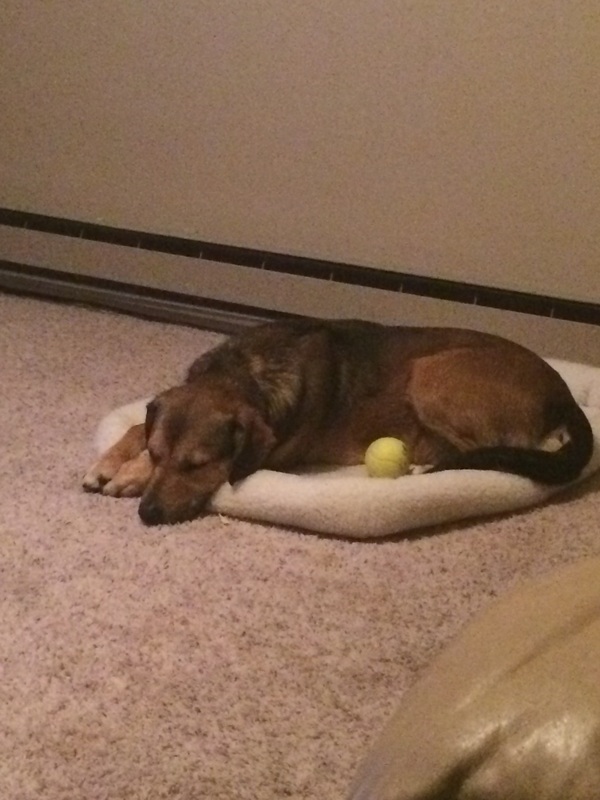 I wanted to give you an update on Kenny, whom we adopted on June 9th at Petco in Springfield. We can't believe Kenny was at your shelter for 3 months! 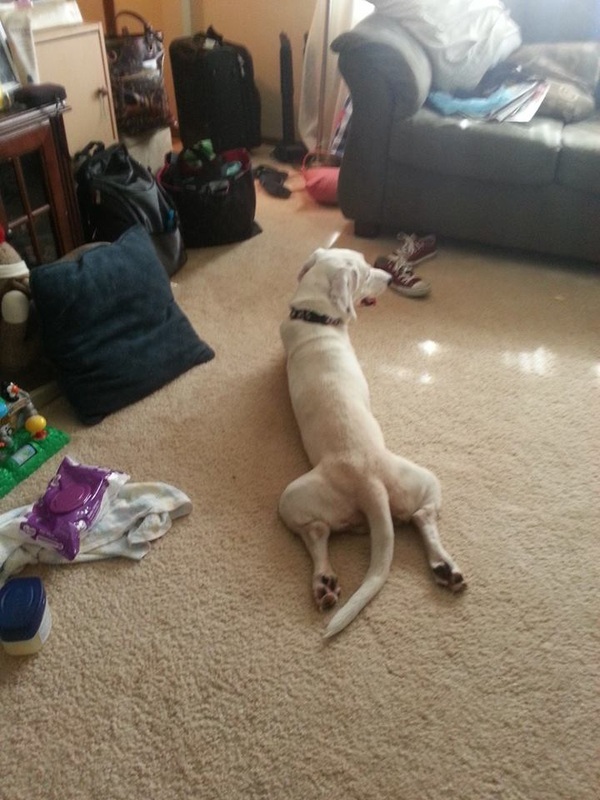 It amazes us that he could have gone unnoticed for so long because he is a fabulous dog! He is so sweet and very "low-key". He and our other dog, Daisy, are co-existing... not quite friends yet, but Kenny seems satisfied letting Daisy be the Alpha. Kenny is friendly with everyone in the family and with guests. He seems to have developed a special bond with my 21 year old daughter. Thank you for Kenny. He has been a fabulous addition to our family!